Q: What is your position on averaging up as a stock advances? A: If I had a choice with any stock, I’d prefer to average up, but each stock has its own personality. The stock you mentioned has proceeded forward in price only after consolidation periods. Having said that, I’d wait for a price pull-back and a pause before picking up more shares. However, if volume soars, you should try to get the low price for the day. After a stock hits a high, it usually retraces, providing an entry point. A: Of all of the questions we receive, this is the most common. Short answer: it depends. Understanding stock pricing is one of the most challenging parts of good investing. For your convenience, we’ve outlined below the circumstances under which stock price matters and when it doesn’t. For almost everything we buy in life, price matters. From gasoline to automobiles, cheeseburgers to chateaubriand, we’ve learned that the lower the price, the better the deal. There are some things you just can’t get on sale, of course– you can’t cut coupons for college tuition, (of which I’ve paid plenty), hip surgery, or property taxes out of a magazine. But for most discretionary purchases, where retailers compete for your business, items are sometimes on sale, and if you can get them at a discount, you can save a lot of money. The same is true in the stock market to some extent. You can pay full retail price by buying a stock as it’s hitting all-time highs, or you can save by buying when the stock is temporarily on the discount table. But how do you know what’s a good discount? You could use simple percentages, figuring that if a stock is selling 20% off its recent high it’s probably a good deal. But that’s a rather crude method because it mistakenly treats all stocks the same, and you know that an electric utility that’s yielding 3% is not the same as a Chinese medical stock that came public last year. A better guide to a stock’s appropriate discount is the level of its 25-day and 50-day moving averages. When a stock that’s in an uptrend has descended calmly to one of these levels, and paused there, the odds are good that the uptrend will resume, and that the stock will soon be selling at full “retail” price again. We refer to these averages a lot in our publications, and recommend that you note them whenever you’re evaluating a stock. Also note that when a stock falls through one of these moving averages at high speed and/or on heavy volume, it’s a bad sign, suggesting that the quality of the merchandise may be lower than previously perceived. And when perceptions about a company’s value are changing for the worse in a big way, you should stop thinking about acquiring it on sale: you should shift your focus to stocks that are still in unquestioned uptrends. There’s a lot of merchandise in the stock market, and there’s no need to get hung up on owning any one particular item. Growth stock investors tend to favor stocks that are going up. 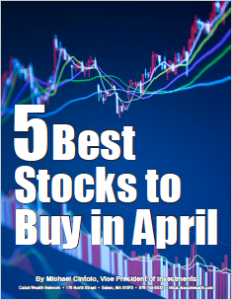 History shows those are the stocks most likely to be higher in the days and weeks ahead. Low-priced stocks, contrarily, tend not to be going up– they tend to be going down. In fact, when you consider that most stocks come public in the magic range above 20, you realize that most stocks that are priced under 10 have lost more than half their value. They’ve disappointed investors, and some of those investors are just waiting to sell until their stock gets back to the price they paid for it, a phenomenon that tends to weigh on the stock. Furthermore, low-priced stocks tend to be thinly traded, meaning institutions are not involved in a big way. Any investor would prefer to see his stocks rise sooner than later, so investing in stocks that institutions, with their billions of dollars, are pushing up is generally a good idea. The main reasons that investors like low-priced stocks are obvious. First, they think it will be easier to double their money in a two-dollar stock than in a 200-dollar stock. After all, the 2-dollar stock only has to go up 2 dollars! Trouble is, nine times out of ten it doesn’t. Now, once upon a time, in the pre-computer era, it made sense to buy round lots. The fellow who purchased an “odd lot,” perhaps 73 shares of a stock, had his order handled by the odd lot broker and didn’t get quite as good a price as the round lot buyer. But those days are gone. Mike Cintolo (editor of Cabot Top Ten Trader), in fact, says that he almost never buys round lots. If he wants to allocate 10% of his portfolio in a stock, he invests exactly 10%, focusing on the dollar amounts and ignoring the number of shares. The sad fact about these investors who focus on low-priced stocks is that they end up ignoring most of the best stocks, and any investor who limits his focus to stocks under 10 dollars is going to be ignoring most of the market’s big winners. There are 2379 stocks trading under 10 dollars. These tend to be riskier and more thinly-traded. There are 3316 stocks trading in the sweet spot between 10 and 50. This is the price at which stocks tend to come public, and it’s the level to which they return when they’re split. There are 573 stocks trading between 50 and 100. These are the stocks with solid potential that haven’t quite made it. There are 114 stocks trading at over 100 dollars per share. These are the winners, the champions. Those stocks have reached that level by appreciating, and some of them are never coming down. Berkshire Hathaway (BRK-B), for instance, under the control of ace value investor Warren Buffett, has never split. It now trades at an eye-popping 140,000 dollars per share. Following in the same mold (though not exactly touting the fact) are the ultra-smart managers of Google. My message. If you’re investing for growth, you ignore those high-priced stocks at your peril. George Steinbrenner won six World Series by staffing his New York Yankees with high-priced talent. John Henry did the same with the Boston Red Sox. And you can do the same with your own portfolio. Growth-oriented investors should generally ignore stocks trading under $10. Down there in the basement, the odds are generally against you. Every year around December, investors start considering how their portfolios are going to look at year-end, and they start considering the tax implications of their actions. As a result, we see two big phenomena. First, we see “window-dressing.” Professional money managers whose clients will get a snapshot view of the portfolio at year-end tend to load up on high-profile winners, driving those leaders to greater heights. And hedge funds that get paid based on their performance at year-end, will drive up the stocks they own, to help their results and put more money in their pockets. At the same time, investors who hold losers sell some of them to offset the tax liabilities from the winners they’ve sold during the year, thus driving those weak stocks even lower. The result? By late December, some of these “losers” are oversold and ripe for a bounce. The best part of the bounce runs through January and into February. And the biggest bounces come from stocks trading under 10 dollars! Every December, we publish a special report highlighting 10 low-priced stocks that we think have great bounce potential. These stocks can add a little spice to your portfolio in the month of January—and if you’re really lucky, some of them could turn into long-term winners. But you shouldn’t fall in love with them. These stocks were specially selected for this one particular job. I recommended that you buy several of them in late December, and sell after their bounce has run its course. Q: How do you handle earnings gaps? A: Every quarter, every publicly held company must report its earnings for the previous quarter. As you might expect, these earnings reports often result in short term jumps or dips in the stock price. These changes are referred to as ‘earnings gaps’ and can represent an opportunity for investors who know how to handle them. The stock should up significantly on earnings—usually 10% or more, and hopefully much more; a mild 5% or so doesn’t cut it. Volume should be extremely heavy. That’s usually the case, but as with the size of the gap, the bigger the volume, the better. Keep in mind where the stock is within its overall upmove. If a stock has been advancing strongly for a few months, possibly enjoying a bullish earnings gap (or two) during that time, any further gap up can often mark a top, even if it’s just a temporary one. Conversely, a stock that is just off its lows can have more room to run, even after a significant gap up on earnings. Give extra credence to a big, liquid stock that sports great growth numbers that gaps strongly on earnings. These stocks are often irresistible to institutions who pile in for weeks after an unusually bullish report. There are dozens of examples (both good and bad … we’ve experienced both), but the point is that a fundamentally strong company that gaps up huge on its earnings is often a great candidate to be purchased right then. So while earnings season provides plenty of risk (that any current holding can gap down), it provides even more opportunity, both from stocks you own gapping up, and from new leadership that you can buy. Q: What is your philosophy on short selling? A: When the market begins to break down and one or more of our market timing indicators turn negative, we often get a few inquiries about shorting. Do we short? Why or why not? What are the advantages or disadvantages of shorting, especially with all the inverse ETFs in existence today? In general, we do not go short (or bet against the market with ETFs) in the Model Portfolio, and the reason is simple: It’s extremely difficult to make good money shorting unless you’re an active trader. If you are, more power to you. But since we aim for intermediate- to longer-term gains, it only makes sense to attempt shorting if you’re in a bear market … which our Two-Second Indicator and Cabot Trend Lines tell us is not the case today. Also, in our various studies and research over the years, we haven’t heard of many investors making a boatload of money on the short side. The reason is simple math: When you’re investing in companies with revolutionary new products and services, a stock can rise 50%, 100% or more if you catch a real winner and remain patient. When shorting, however, your profit objective is usually much smaller—20% to 25%—mainly because sharp rallies come during downtrends and usually wipe away a few weeks’ worth of gains. Instead of letting winners run, you need to take profits quickly! Given that a loss limit is probably 10% or 15%, shorting is not a very attractive reward-to-risk ratio. Last but not least is the psychological factor: Very few people are able to “play” the market constantly, day in and day out, following a bunch of stocks and earnings reports, researching stories and so on; months and months of action can be draining. And so, during any downtime, it’s often beneficial to take a step back, re-evaluate what stocks and sectors are doing best, and get ready for the next upturn. Of course, we don’t pretend to have the sole rule book on investing; we’re sure many of you use short-related instruments (ETFs, options trading, etc.) with great success. But our point is that, right now, when the market is likely at worst in an intermediate-term correction (not a new bear market), your best move is to focus on holding some cash and preparing for the next major upmove … and the opportunities that come with it. Q: How do I perform a stop-loss order? A: A stop-loss order is a type of sell order in which your targeted sell price is set at a fixed percentage or dollar amount below the market price. If the market price of your stock rises, the stop loss price rises proportionately, but if the stock price falls, the stop-loss price doesn’t change. This technique allows you to set a limit on the maximum possible decline without setting a limit on the maximum possible gain, and without requiring paying attention to the investment on an ongoing basis. You can give instructions to your broker online or over the phone using the same routine you use when placing regular buy or sell orders. Most brokers offer automatic trailing stops, but if your broker does not offer this type of order, you can raise the stop on a daily basis as the stock rises in price. If you own a stock and decide to place a trailing stop-loss order, you can enter a sell order with a trailing stop loss of any dollar or percentage amount that you wish. For this example, we’ll use a stock that is currently priced at 141 and a trailing stop of 7.00. What this means is that if your stock falls by 7.00 from the price at the time you place the stop-loss order (in this case, 141), your order will be triggered and your stock will be sold (at 134). And if your stock climbs to 144.00, your stop loss, since it is trailing, will automatically be raised to 137.00 (144.00 less 7.00). Should your stock continue to increase in price, your trailing stop price will automatically be increased (and your profit will automatically increase, too). But sooner or later, your stock will fall 7.00 from its highest price (since your order was placed) and your shares will be sold.